Submitted by stephen on February 18, 2012 - 14:49. Sunday saw the gluing of the sixth and final planks in place. So the boat has its shape and once the stems and hog are fitted and the hull cleaned up, the turn over happens. Another big turn out on Sunday, with two of Gary’s friends (brothers John and Colin Wilson) coming down from Aberdeen to have a look and then finding tools in their hands, work progressed on the four oars and the hog. Gary Donaldson and Stephen Hall battled with the large piece of oak provided by Ian Buchan to generate thin planks for the outer gunwales ( the piece of wood at the side of the boat to protect the hull, when it is alongside other boats). Submitted by stephen on February 14, 2012 - 12:10. Lewis King and David MacAulay joined the ranks of those who have wielded a plane in the boatshed, bringing the total number of boat builders to 22 and that does not include the P6/7 class. We also had visits from Julia MacAulay and the village bard, Dave Ramsay, who arrived just in time for a cup of tea and a fine coffee cake baked by Chris Anstock. On Friday, Gary and Chris pressed on by bevelling the frame extensions which will attach the inner gunwales to the main frames. A fiddly job, with not much to show for the effort. Submitted by stephen on February 14, 2012 - 12:06. "Is that the right way round?" 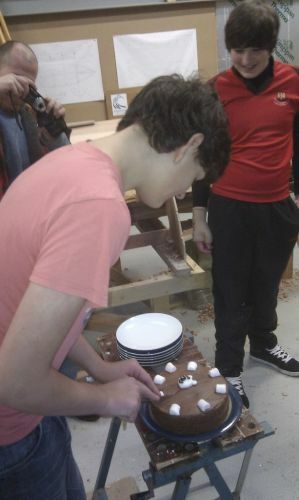 In which the boat is sanded, cake is eaten, and disaster averted. "Could I have a piece of sandpaper, please." The boatshed received Mrs Martin's P6/7 class on Friday morning. After a short intro about the community project and how we are building the boat, by Rob, Gary and Chris, the class was put to work And did they work hard. There were oar blades to be planed into shape. Spokeshaves were operating at both ends of the boat as the ends of plank 3 were shaped into the stems. There was great enthusiasm combined with patience as they waited there turn on a plane. 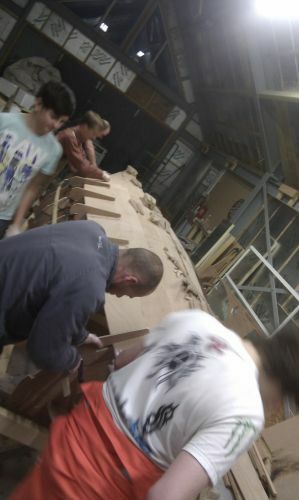 Gary also got them started on sanding down the hull. And the rare phrase, "Can I have a piece of sandpaper, please" was heard. With ten enthusiastic sanders, the shed was soon full of dust. Submitted by stephen on January 30, 2012 - 21:28. Six people were flat out on Sunday and were very productive. Both planks #2 were bevelled and prepared for plank 3. The component parts of plank 4 were scarphed. The blades on the first two oars were worked on to start getting the blades into shape. Then there was a big epoxy session with two more oars glued up and two planks glued into position (plank #3). This week coming we have a visit from the P6/P7 class of Catterline Primary School on Friday. They will be put to work as well as learning about the project. Hopefully the planks 4 can be glued together, which will allow them to be attached next Sunday. I forgot to report last week that we had our first lost time injury. Whilst cleaning up excess glue, a finger managed to get in the way of a chisel. A hospital visit was not required but a plaster was. This week, we somehow had glue in teenager hair. The unfortunate was spotted trying to rinse his hair with water at the tap. When challenged, he explained his predicament and then looked very concerned, when it was pointed out that we are using water insoluble glue for this boat. The question, “So what do I do?” followed. The response ”cut it out” had his fellow teenager in stitches. Submitted by stephen on January 25, 2012 - 14:33.